Tardis is finally back in the water after a host of family health problems, other projects and the campaigning season all conspired against boat work. Last year the topside and deckhouse paint were okay, but not where I wanted them to be, put on just in time to get to the WoodenBoat Show and in the poor shop light. 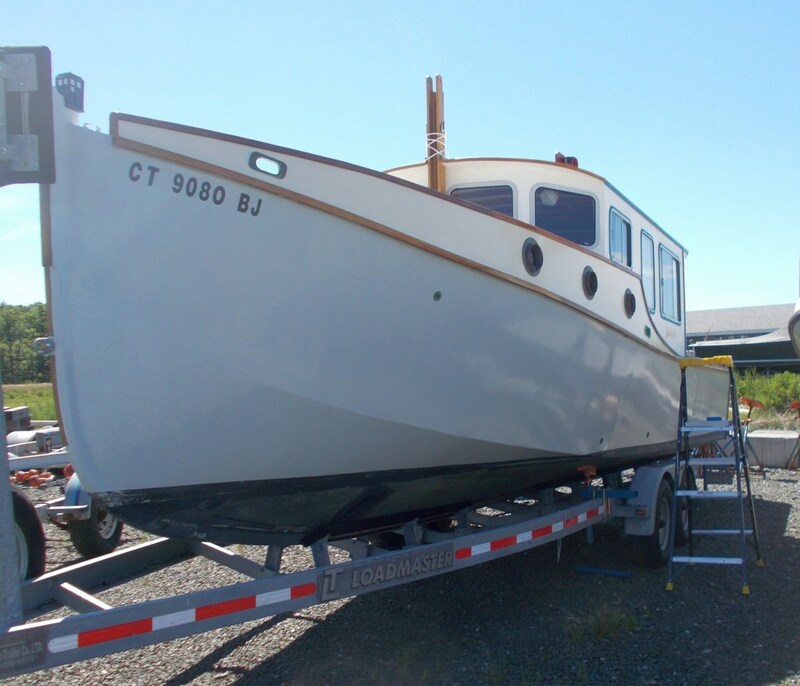 But this year working outside, and with a good surface to sand into, I really got things smooth, and Ray and I rolled-and-tipped a coat of Interlux Brightsides Seattle Gray on the hull. Looks like gelcoat, incredible shine. I love this paint, and about three coats from now it will be even better. 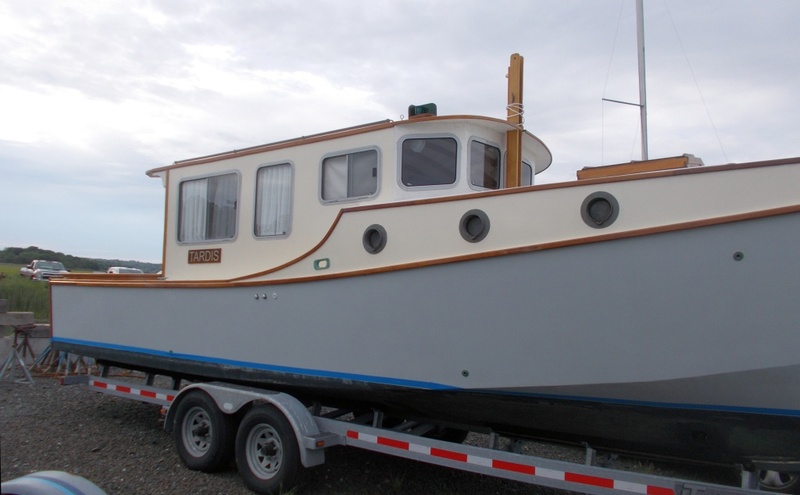 There is an old-timer in Maine named Tom Hill who does not believe in primer — just put on the topcoats, and sand and sand since the substrate is much harder than primer and you can sand down hard to get a really smooth finish. I still need primer for imperfections, but I remember our motorsailer Memsahib looking like glass only after about the third year of painting. As much as I like other Jamestown Distributors products, I can’t get Wet Edge topside paint to go on right, And it seems to pick up dirt that I just can’t get out. 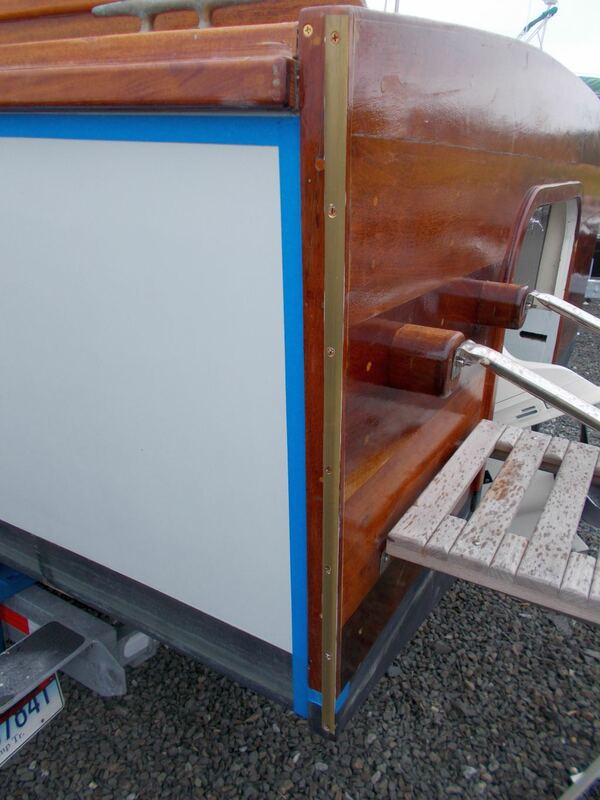 So this year I switched to Interlux Brightsides Hatteras Off White for the deckhouse sides. It is a sort of buff color which just doesn’t show in the pictures, but sets off the varnish much better than the Oyster White I had on. 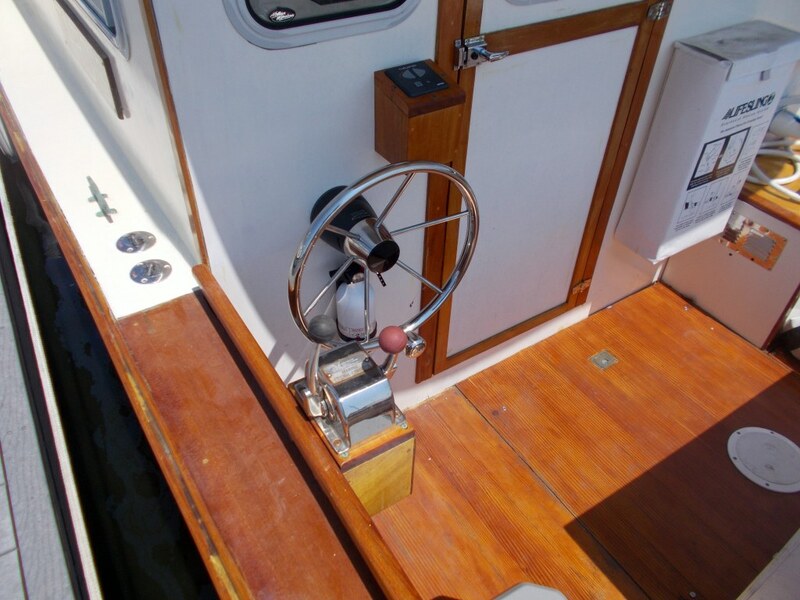 Decks and the cabin top will be a bright white to reflect sunlight and keep things cool. Tried something new with the varnish that I used with the Red Skiff. Jamestown has a quick-dry varnish called Lust that is really pretty good and you can put on multiple coats per day. So I built up the varnish with Lust and finished with Interlux Schooner for depth and shine. Looks good, but we’ll see. 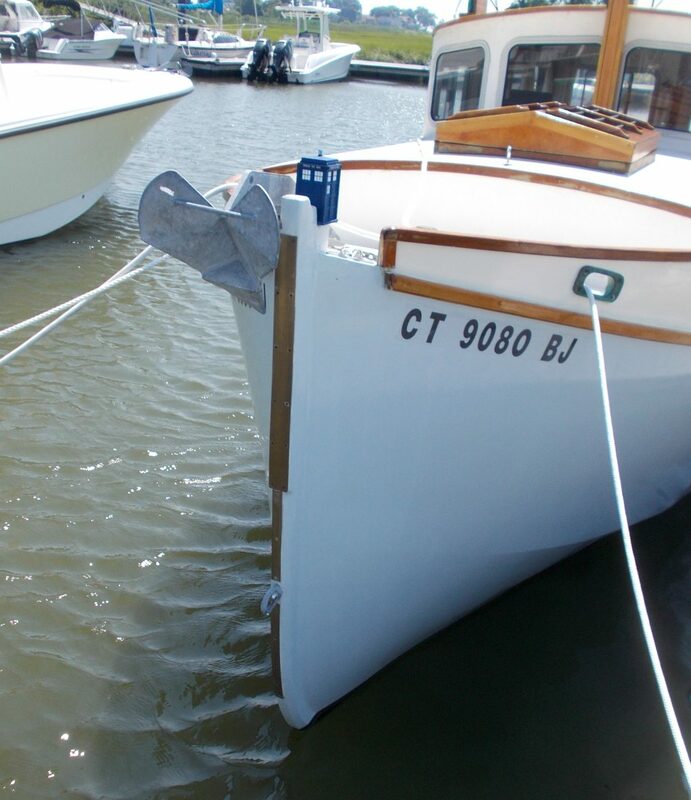 My pointy Delta anchor was banging into the stem when coming up, so I put .125 inch brass strips on down to the waterline. Seems to have solved the ding problem, and looks very salty. 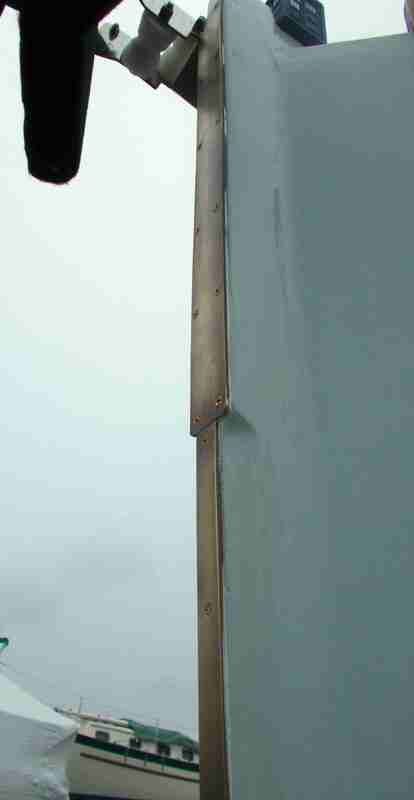 Also but strips on the stern quarters to protect against fixed dock pilings. Put on the new wheel in the outside helm station for the fireworks. SO much better. We had to do some fancy maneuvering in the dark last night and the boat was just much easier to handle. Next up — more painting, windlass and a solar panel, since the outboard just doesn’t put out enough amps for the fridge, etc. Paul, Are my eyes playing a trick on me, or are Tardis’s eyebrows gone? As you know, I am assisting Sytse to build ARNHEM, another Olga28, and I am very (VERY) closely watching all details of all Olga’s ever built.. So, I noticed a 4-inch overhang of the roof (eyebrow, for Neanderthals like us) at the front cabin windows in previous pictures you posted, that seem to have fallen prey to a big uni-brow-eliminator. Or is it just optics playing tricks? On a side note, Still working on a blog site for Arnhem. Sytse is currently in the NL,attending family matters. No opportunity to visit Friedbert and his build, only a mere100 klicks away, alas..
Friedbert had to take down his LUNA website due to EU regulations, but expects to be back soon.Will give you details when available. She looks great. Nice work.